The Pau Castle is located in the French town of Pau. The castle is known that in it was born Henry IV, the French and Navarre King. The castle is the biggest landmark. The building was used by Napoleon as a summer residence. From 1840 the castle was recognized as a historical monument. The castle was built on a hill, though strategic considerations. It was built in the eleventh century and its name gave the name to the city that arose later around it, in the old French dialect, it means a fence, as the castle was encircled by a high fence. The original castle of Pau was a typical medieval castle, which had three towers that were finished in the twelfth century. Watchtowers were erected by order of the Gaston IV of Béarn. Each of the towers had a special name, which bore the name of the locality in the vicinity of the castle. Thus, the towers were called Mazères, Billère and Montauser. In the fourteenth century, due to the Hundred Year War, occurred the need for further fortification of Pau Castle, in order to improve its resistance to attacks. Then the famous Gaston III, known as Gaston Phoebus, had an imposing tower built of brick, which is high thirty-three meters. On the tower, it says in Latin "Febus me fe", meaning "Feb made me". During the reign of Gaston Phoebus, the mining region had autonomy. The same sign stands over the entrance of another fortress near- by that was built by order of Gaston Phoebus for protection of the city. In the sixteenth century, after the accession of the Kingdom of Navarre to France, the castle becomes a royal residence. Here live for some time Navarre Henri II and his wife Marguerite de Navarre, which is the author of the Heptaméron. By the time the two lived in the castle. it was dotted with their initials, which have remained there to this day. The event, which makes the castle of Pau famous in the whole country, is the birth of King Henry the Fourth. The museum of the castle has preserved a cradle, which is made of a turtle shell in which the future king slept as a baby. Although King Henry the Fourth lives in the castle only during his earliest childhood, this castle in particular is associated with his name. In the nineteenth century, King Louis-Philippe I, which became known as the King-citizen, because of his hopes to unite the ideas of monarchy and the revolution, elected Pau as his residence. According to him this place symbolizes reconciliation of warring parties, as was associated with the name of the king, who once put an end to the feud between Catholics and Protestants. At that time, at the castle are a bunch of restoration works carried out, but Louis Philippe was not able to visit the castle. The February revolution in 1848 forced him to abdicate and flee to England. 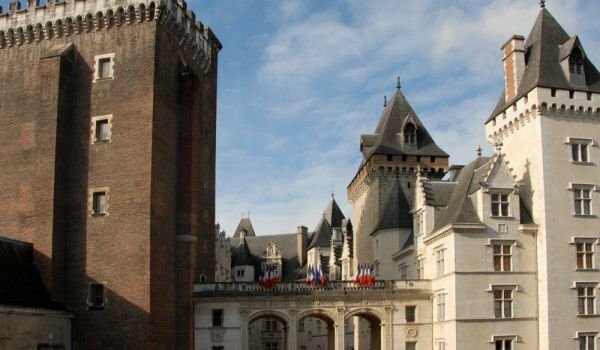 Today, there is a museum in the castle, which has many exhibits of French fine and applied arts, from the age of Henry the Fourth. The castle has kept a large collection of antique tapestries, which is the largest collection in France after Paris. The tapestries are made in the period from the sixteenth to the nineteenth century and represent a masterpiece of the art of embroidery. Many of them depict scenes related to the royal court. Periodically, in the museum exhibitions are made, often with lectures on the history of France and other conferences. Each year, the museum is visited by over one hundred thousand people.